Aqua is an American Earth-observation satellite that, as its name suggests, monitors from space various kinds of physical phenomena related to water and energy circulation. It conducts comprehensive observations of the interactions among the atmosphere, the oceans and the continents, and their effects on changes in the Earth's mechanism. Data gathered by this satellite include profiles of atmospheric temperature and humidity, clouds and precipitation, net radiation, snow and sea ice, sea-surface temperature, oceanic primary production, and soil water. These accumulated data are expected to be used to promote the further development of research on global environmental change, as well as to improve numeric weather forecasts. Aqua was developed as a joint project by the United States, Japan and Brazil. It was launched from the Vandenberg Firing Range in California by the DELTA II launch vehicle in May, 2002. NASA was responsible for the spacecraft and its launch, while Japan and Brazil were in charge of various sensors. JAXA developed a radio sensor and the Advanced Microwave Scanning Radiometer for EOS (AMSR-E), which is helping obtain data to understand global-scale water and energy cycles. AMSR-E is a sensor that can monitor the Earth day and night. 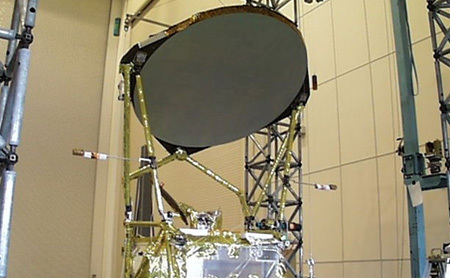 The antenna of AMSR-E has the largest-diameter microwave scanning radiometer (about 1.6 meters), and it can collect water data with an unprecedentedly high definition. AMSR-E uses microwaves instead of optical sensors, and thus can continue observation day and night, regardless of the weather, and without being interrupted by clouds. AMSR-E has demonstrated the usefulness and viability of microwave-based observation of the Earth's land and sea-surface under clouds. The data obtained will be provided to the Japan Meteorological Agency and the Japan Fisheries Information Center. They are expected to improve the accuracy of weather forecasting and to provide other practical benefits. Vandenberg Launch Site in California, U.S.A.